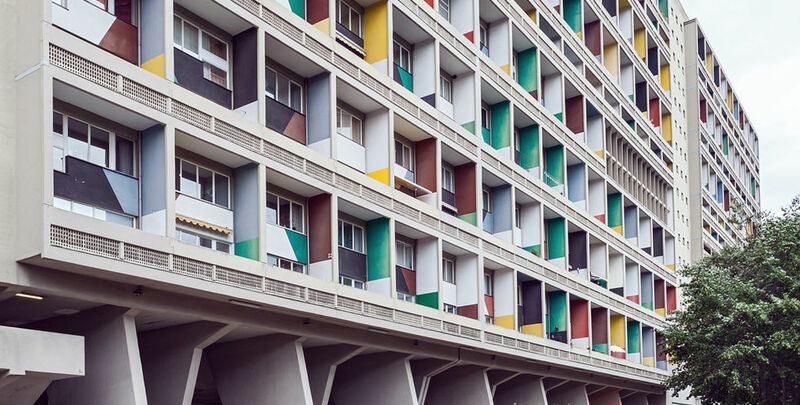 Flatowallee 16, 14055 Berlin: The noteworthy address of the one of the most architecturally significant residential buildings in Berlin – the Unité d'habitation. 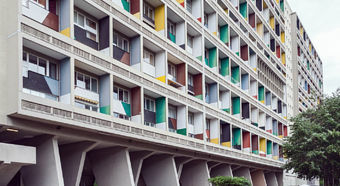 Designed by Le Corbusier (1887–1965), one of the most influential architects of the 20th century, the ‘living machine’ is the archetype of the ‘vertical city’ movement and still attracts architecture enthusiasts from around the world. 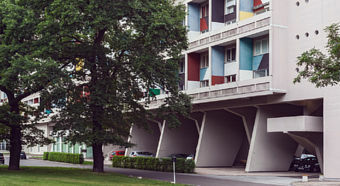 The Corbusierhaus in Berlin came about as part of the International Building Exhibition of 1957 (Interbau), which was held to address the acute housing shortage after the war. 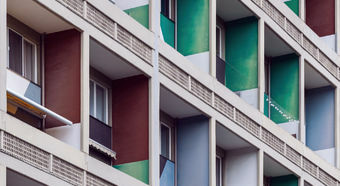 By this time, Le Corbusier had already made a decisive contribution to residential construction through his studies on urban development and the completion of two Unités d'habitation in Marseille und Nantes-Rezé. 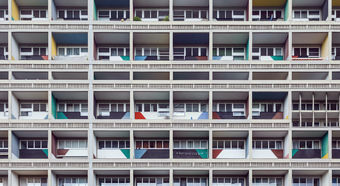 The main idea behind the design was the standardised serial production of architecture and interiors, through which a high level of profitability could be achieved while also increasing the standard of living in the social housing sector. Due to its planned size – approximately 141 metres long by 23 metres wide and 53 metres tall – construction of the Corbusierhaus did not take place in Berlin’s Hansa district, the site of Interbau, but on Olympic Hill near Berlin’s Olympic Stadium on the outskirts of Grunewald. 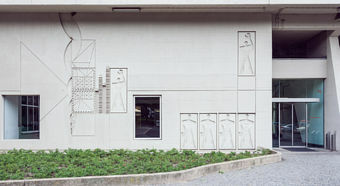 The building was constructed using an on-site factory in a record time of only 18 months. It was declared a national monument in 1996. Built using the frame construction method, the skyscraper was elevated on slender columns to allow the natural surroundings to literally flow into the ground floor. 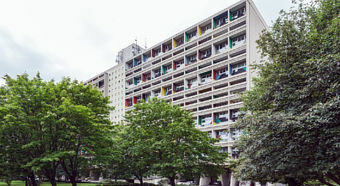 The foyer itself serves as an entrance hall and meeting place for around 1,400 residents, while continuing to promoting Le Corbusier’s sociological philosophy of harmonious coexistence. 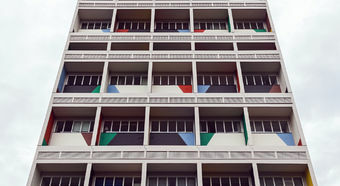 A total of 530 flats spread over 17 floors are accessed by ten ‘Rues Intérieures’ (indoor streets), which are connected to the foyer by a bank of lifts. 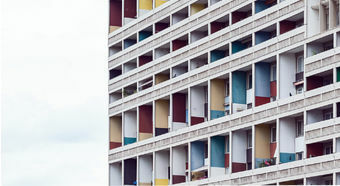 With the exception of the one-room flats, the flats were designed as maisonettes. 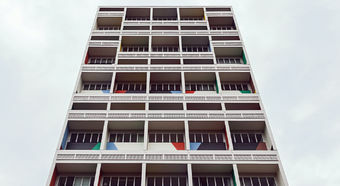 In addition, the three and four-room flats are situated crosswise through the building, giving residents magnificent views over Berlin from both the east and west façades. 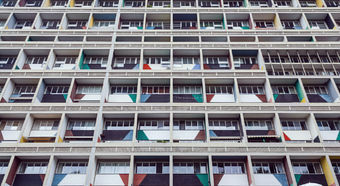 In 1979, the flats were converted into freehold flats and the owners tasked with maintaining or restoring the Le Corbusier’s legacy. The composition of the current residents is similar to that of the ‘original inhabitants‘, mostly people with free and creative professions such as doctors, lawyers, independent artists, actors, event managers and, of course, architects. 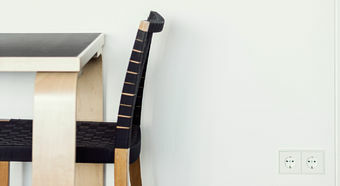 After architecture editor Benedikt Hotze acquired a 33-square metre, one-room flat on the fourth indoor street in 2011, he commissioned architect Kathrin Bunte to restore the flat to its original state using contemporary living standards. The flat is currently leased as a temporary residence. The result is impressive: Visitors are transported back to the 50s immediately upon arrival thanks in part to the rectilinear furnishings and the restored original flooring of dark-green DLW linoleum. 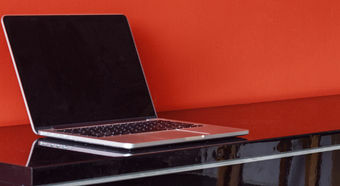 Baseboards in the same colours as the walls give an impression of smooth transitions between walls and floors. The original partition between the living room and kitchen was rebuilt, with a sliding window ‘typical’ of Le Corbusier once again employed as a serving hatch and a source of light for the kitchen. 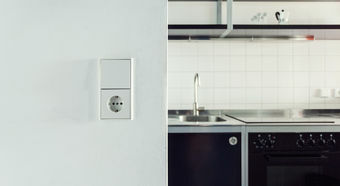 Even details such as the original bread roll box in the corridor or the mechanical ventilation devices in the kitchen and bathroom have been retained. 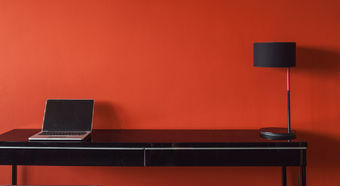 By using polyChro©-interieur wall paint from Keim, a velvet-matte and especially colour-intensive shade of 4320A rouge vermillion 59, the walls present an unrivalled sense of depth and elegance, entirely in keeping with the spirit of Le Corbusier. 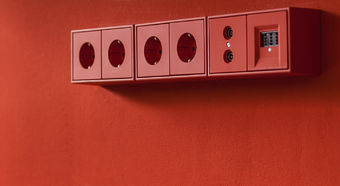 The harmonious combination and interplay of the Keim paint and JUNG electrical installation, also in 4320A rouge vermillion 59, reflects the remarkable combination of products in Le Corbusier’s® network of partners. 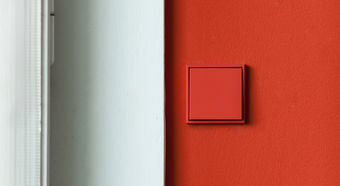 As a worldwide exclusive, JUNG has been offering a reinterpretation of its classic LS 990 range of switches in the 63 Les Couleurs® Le Corbusier since 2014. 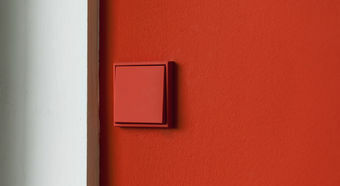 To enhance the already impressive depth of colour, the switches are hand-painted using a special process to render their matte finish. 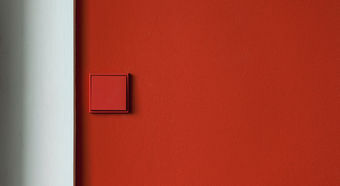 All 63 colours of the ‘Architectural Polychromy’ can be easily and seamlessly combined with each other as well as with other products in the JUNG LS 990 series. 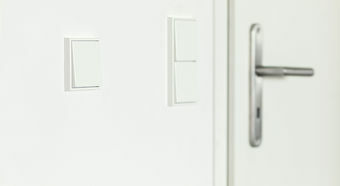 The surface-mounted version of the timeless LS 990 range in Les Couleurs® Le Corbusier – the same used in the Corbusierhaus – impart a particularly elegant touch to plaster and natural stone surfaces.